 Home » Lagonda Rapide Parts | Four Ashes Garage Ltd. The Lagonda Rapide was introduced in 1961, largely based on a DB4 but with 3995cc engine (before the DB5), 2 x Solex 44 PHH carbs, automatic transmission (except for 7 cars) & De Dion rear suspension, this 4 door saloon used a lengthened DB4 chassis (by 16"). We only stock a few parts, one of which is listed.